New Year’s Day, and I am thinking about what a happy day I spent with you folks in your home on Christmas Day. I felt I must thank you again for having me and to tell you how much I enjoyed being with you. You cannot imagine what it means to one with no family ties left, to have dear friends on such a day. Thank you again for a lovely dinner and companionship, and for the lovely sweater and ear rings. Thanks, too, for dear David’s kindness to me on the occasion of our trip to Lafayette. I love him dearly. 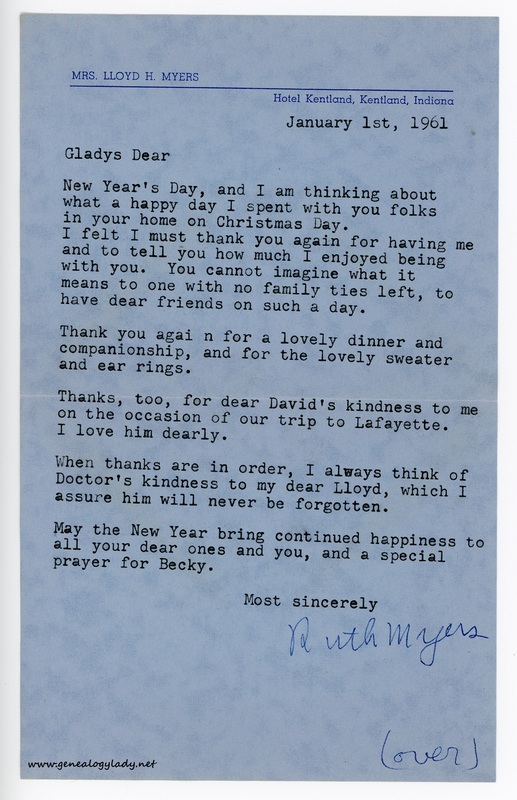 When thanks are in order, I always think of Doctor’s kindness to my dear Lloyd, which I assure him will never be forgotten. May the New Year bring continued happiness to all your dear ones and you, and a special prayer for Becky. Forgive me useing the typewriter, but it is so much easier for me than trying to hold a pen for any time. My fingers just don’t seem to want to do it. 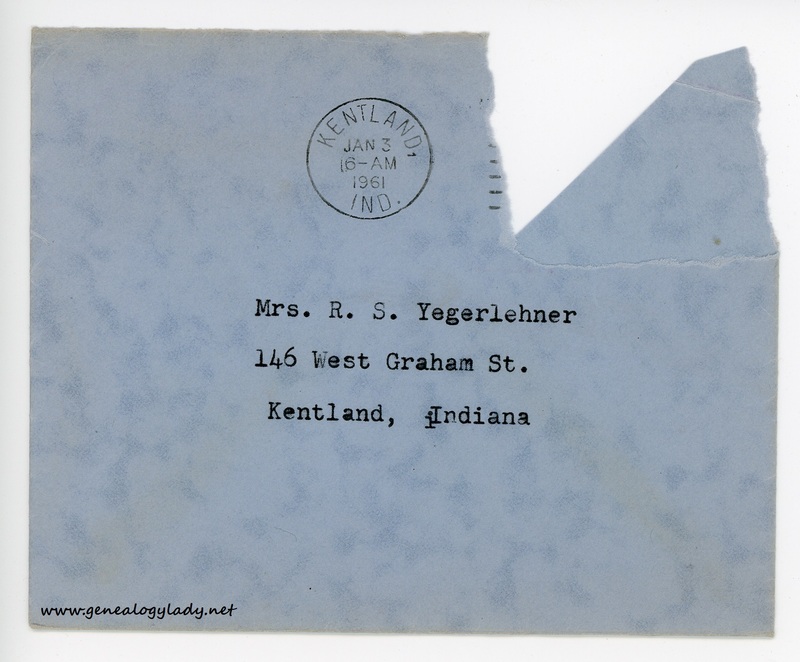 This entry was posted in Genealogy, Ruth Myers, Yegerlehner and tagged 1960s, David A. Yegerlehner, genealogy, Gladys R. (Foster) Yegerlehner, Indiana, Kentland, Lloyd H. Myers, Rebecca C. Yegerlehner, Roscoe S. Yegerlehner, Ruth M. Myers on August 5, 2016 by Deborah Sweeney. This is a very touching letter. It is so great that these documents survive; they are evidence of events that meant so much to people–but that have faded, sadly, from memory. 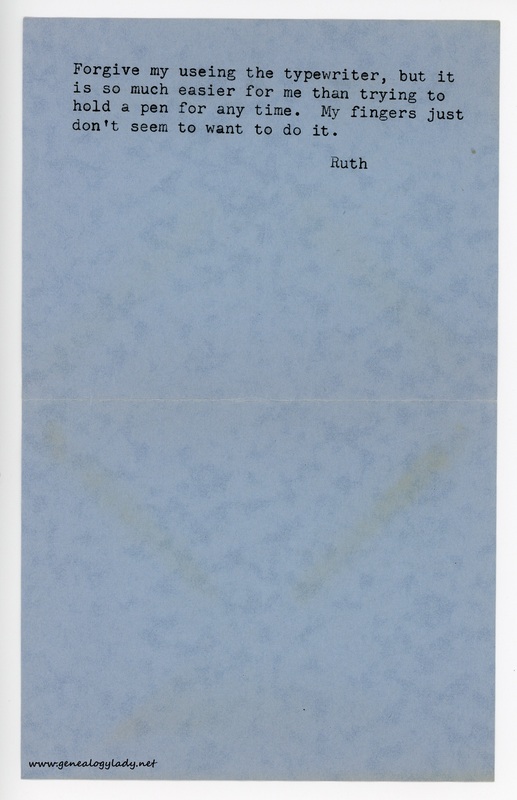 I love the day to day events and feelings Ruth’s letters evoke.